Olivia Punnett is a visual artist whose work deals with themes of memory, time, immateriality, ephemerality, indecision and distortion; resisting any attempt towards literal or direct meaning. Her complex installations typically involve projection, sculpture, new and archival photography, and refracted print images. She currently lectures at Nottingham Trent University and is the director of Haarlem Artspace in Matlock. 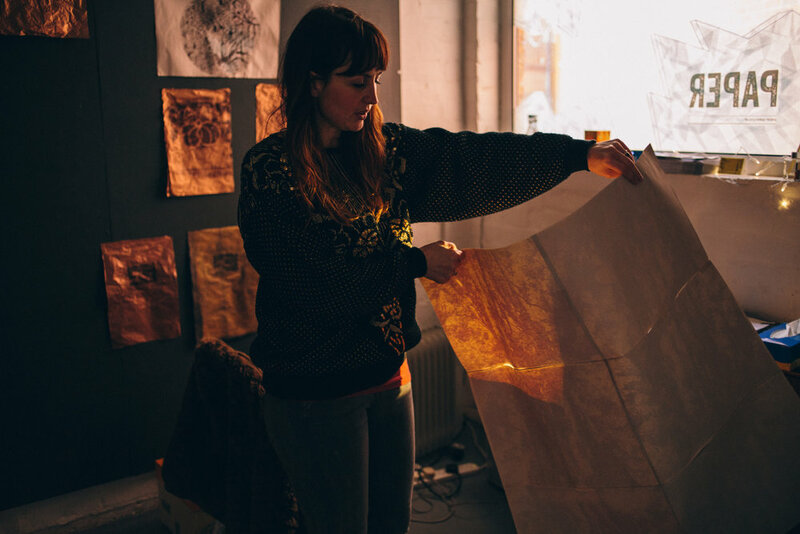 Punnett is the latest artist to have taken part in PAPER’s Exploring PAPER residency, which grants six weeks of time and space to develop work. Here she reflects upon the experience. Sara Jaspan: You initially approached the Exploring PAPER residency with what seemed like an interest in the ‘spiritual’ dimensions of paper, particularly in regard to its Eastern origins. What initially sparked this interest? To what extent was it already present in your previous work? And what new understandings, discoveries or creative avenues has this line of enquiry led to? Paths – Pathways should never be straight. They should meander like a stream. This helps deepen the landscape by adding layers. The path can be the river, or a path along it, or the tracing of the sun through the sky over the shoulder of the mountain. The concept is to never create inorganic patterns, but instead to mimic the patterns that nature creates. The Threshold – The path should lead to a threshold. The threshold is there to embrace you and provide a special welcome. The threshold can be the mountain, or its shadow upon the ground, or its cut into the sky. The concept is always that a mountain or its boundary must be defined clearly. The Heart – The heart is the focal point of the painting and all elements should lead to it. The heart defines the meaning of the painting. The concept should imply that each painting has a single focal point, and that all the natural lines of the painting direct inwards to this point. The other important thing that I discovered about paper is that it had been used to package early bronze mirrors in ancient China. Mirrors have been present in my work for a long time, as has an interest in phenomenological illusion, reflection and the reflected image. I had been using mirrors alongside projection, and the metaphor of mirrors alone interests me. So, the connection instantly felt very relevant. I mono print and often use the surface of mirrors to ink up and print from. These mirrors then become ‘black mirrors’, which the artist and writer Svetlana Boym (a key reference for me) discusses along with nostalgia. Through my research, I also discovered the ‘Claude Glass’ – a portable drawing and painting aid that was widely used by landscape painters in the late 18th and early 19th century. The artist would turn their back to the scene and instead observe it through the framed view of the tinted mirror, which added the picturesque aesthetic of a subtle gradation of tones. It fascinates me that these painters were painting from the reflected image rather than the real thing, and it’s this love of the reflected image that drove me to begin experimenting with a black mirror myself, catching reflected projections in it. I am not sure how this will manifest in my work yet. In terms of new understandings, I am very interested in the circular shape of the mirror I’ve been using to print from. I would also like to explore obsidian further – a naturally occurring volcanic glass, which is produced when felsic lava extruded from a volcano cools rapidly with minimal crystal growth. It has a very dense, velvety appearance and contains absolutely no glare at all, providing in a beautiful image quality. SJ: At the outset, you described your vision for the residency as ‘ritualistic’ (tapping into an interest in the mystical) and hoped to invite a shamanistic practitioner into the process. How did this approach manifest and what impact did it have on the work that you made? OP: For Exploring PAPER, I’ve tried to approach making in a very considerate and self-reflective way – even more so than normal. I have been burning propolis and frankincense on the heater to make my own space, and tried to occupy it in that way. I have to say, however, that creating something, and ‘making space’ for the unknown in the way you do as an artist (or the way that I do), is not vastly different, so I felt like I was practicing as normal in the end. Just prior to beginning the residency, my friend (a shamanic practitioner) sent me some information on Doctor Dee’s Black Mirror, which is housed in the British Museum. I didn’t look too deeply into this at the time, but when I arrived in Manchester, I visited Chetham’s Library near PAPER Gallery and discovered that a John Dee (c.1527 – 1608) had been warden there before it opened to the public. He was Queen Elizabeth I’s Royal Astronomer. Two interesting coincidences occurred to me: firstly, that John Dee is my father-in-law’s name, and secondly that one of my favourite albums of all time is Royal Astronomy by MuZiq / Mike Paradinos. Later, I was visited by another friend and artist, Sian Williams, who used to work at the British Museum. She told me about Doctor Dee’s mirror, and I then realised it was the same John Dee. SJ: How did your research at Chetham’s Library influence the residency? OP: Apart from this strange set of coincidences, and appreciating seeing where Marx and Engels wrote the Communist Manifesto, it did not continue to influence my work. But it may still do! SJ: What impact did visits from other artists and members of the public have on the residency period? OP: It’s quite strange making work that’s being seen by the public before its complete. But I’ve always felt that projection-based art has a temporal, unfixed and constantly evolving quality to it, even when it’s finished – so that part wasn’t too challenging. I also found that being asked about the ideas and where they came from constantly brought me back ‘home’ – to where I’d started from – so it was quite grounding in that sense. Using the residency space for 2D mono print work and print transfer made it easier to connect to an audience. But I did have a moment, about halfway through the six weeks, when I started to really miss the sculptural element of my practice. So, I began making a set of folding oak frames to house the prints that I’d been making and a series of stretched paper screens to project onto. This added a real level of dimensionality to the work. I haven’t felt the presence of an audience for a long time as I missed the opening of my last show because my daughter was very ill (thankfully I still managed to situate my work and curate with the other artists beforehand), and I curated Internal Nebular at Haarlem Artspace but my own work was not included. Having visitors enter the process and view my work throughout the residency reminded me of how important this is. It has also given me more opportunity to think about the way in which work is presented, and exhibition devices in general in regard to my own work, which is very useful. SJ: Memory and the instability/intangible nature of the image have previously been important themes within your practice. To what extent do they feature in the work you made during the residency? OP: They feature heavily because I am still compelled to move the image from its first stage. My friend, Katherine Mager, who visited for a weekend during the residency, brought a series of risograph prints with her. I taped them together to make a large paper canvas first of all, and we experimented with projecting onto them. I then began white-washing them and drawing and printing on top. Moving the image to different stages is important to me, as is fragmenting it. For me, this relates to the recalled or recollected image. It also increases distortion and starts to break an image up, loosening your grip on the original, just like you do with the memory of an event. I came across ‘the Droste Effect’ right at the beginning of the residency and this also does a similar thing – moving the image into obscurity. I am not sure why I feel the need to interrupt the image, but re-printing, projecting and using the reflected image are all important permutations within my practice. SJ: What is the most valuable thing you’ve taken from the last six weeks? How do you think it might shape your work going forwards? Having the time and space to actually make art, to think about my art practice, to talk about it, and get lost in practical making. It was another opportunity to get to the heart of what is important to me, which things I cannot let go of, and which things I am happy to put down for a while. As a mother, lecturer and director of busy artist studios, having this opportunity has been incredibly valuable and special. Going forwards, I feel that I now need to let the work sit for a bit and play with the second stage of presenting it. I often use different kinds of handmade glass to frame prints behind, which isn’t very transportable, so I will now start experimenting with the positioning of the glass, different lenses and different methods of projection. I will also continue printing from the imagery used within the residency.